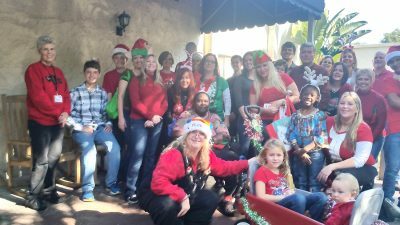 Lisa Esposito went back and forth about whether to pursue her annual charity this holiday season, which she calls Elves for the Elderly. Each year, Lisa Esposito of Riverview, gathers enough volunteers to adopt between 200 and 350 indigent elderly for the holidays. Some visit a nursing home to bring the gifts to the residents, singing carols and handing out gifts to all. Lisa is front and center in the Santa hat. Battling her own family health issues this year, it seemed nearly impossible to again take on this time consuming, complicated task — finding people to adopt more than 350 indigent elderly folks living in county nursing homes, most with no family. But the giving spirit is strong in this Riverview woman. She is getting a late start but is hoping the community will step up to help. This will be the 15th year Esposito is working with Aging Solutions, a nonprofit whose staff works as guardians for indigent elderly and the developmentally disabled in this region. They get meager Santa lists from each of the wards and deliver them to Esposito and her tight group of annual volunteers, who spread the word. There is a big need for clothing, essential toiletries, dental services and vision services, Esposito said. Some who adopt give money for the dental and vision services while others choose individuals. “People are usually coming in to these nursing homes with nothing,” Esposito said. “It is a huge undertaking to meet their needs. “And they appreciate it immensely,” she said. 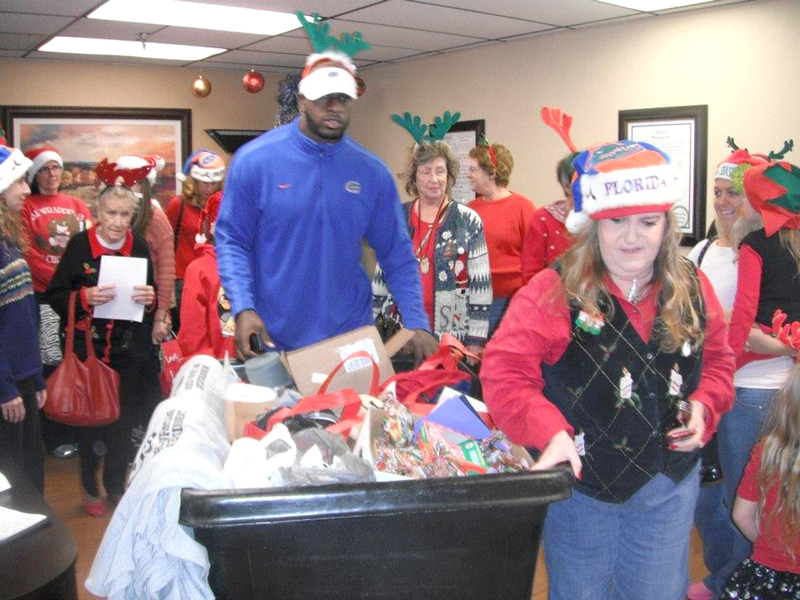 Thadeus Bullard, know in the WWE as Titus O’Neil, a former Gator football great, annually helps with Elves for the Elderly. “Somebody has to take care of these people and show them there is still love and they are needed and they deserve to have one day of the year to feel special,” Esposito said. “You make a difference. You go there thinking you are there to give back and when you leave, you got so much more than you gave. You forget you’ve got so much to do. “You remember the gentleman who sings as loudly as he can to “Rudolph the Red-Nosed Reindeer” even though he has had a stroke and is paralyzed.” Volunteers on delivery day walk through the halls singing carols and giving something to everyone, whether or not they are on the list. Some get a pair of socks, others get cookies or candy. “You remember the one who couldn’t walk around the nursing home because he didn’t have a pair of shoes that fit him. When he got his shoes, he danced and sang “Rudolph” with our group. The elders love it. “They are so excited to see us coming,” Esposito said. “Even though they might not be in the program, there are about 250 elders and we bring something for everybody. “It is sometimes the only thing they will get for the holidays. This all started when Esposito, an attorney, was in the courthouse in downtown Tampa one day and read about the cause on a bulletin board. “I have always been involved in assisting nursing homes since I was a child,” she said. “Mom would choose a nursing home, and we would adopt it. When I was in Girl Scouts and in parochial school, we would visit a poor nursing home. Four generations of her own family are not only adopting but are working hard to get others to adopt. “Me and mom, nieces and nephews, and now their kids are all involved.” Her nieces, Crystal and Jennifer Esposito have gotten involved with getting elders adopted and have put together a Facebook page to get more people involved.